The XLINKBT uses is a cellular to landline telephone gateway that uses a bluetooth connection to your prepaid or pay as you go cellular phone. This adapter is perfect for those who do not have standard telephone service but do have a cellular phone with bluetooth. Your cell phone can be left charging is a convenient location. If your cell phone rings - all the phones connected to the XLink ring. Make outgoing calls using the telephones connected to the XLink even though you no longer have a landline! 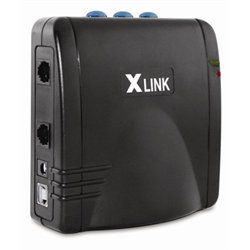 The XLinkBT can be used to provide a phone line for a single home phone, the entire home, a laptop or other devices requiring a telephone connection.